Summary: The action continued throughout the second hour, with Porsche, Audi and Toyota all leading laps. The biggest drama being the #7 Audi undergoing a costly turbo change. 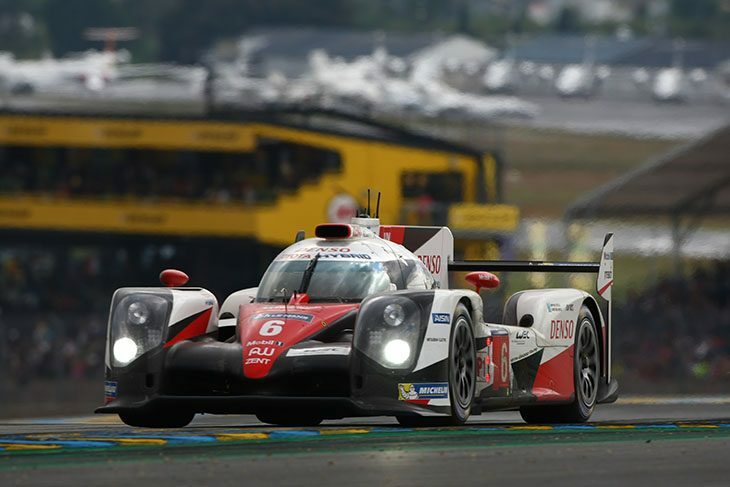 The #6 Toyota led the end of the second hour, but all manufacturers were in the mix. As the second hour began, it was nose-to-tail action at the head of the field, with Mike Conway continuing to lead in the #6 Toyota. 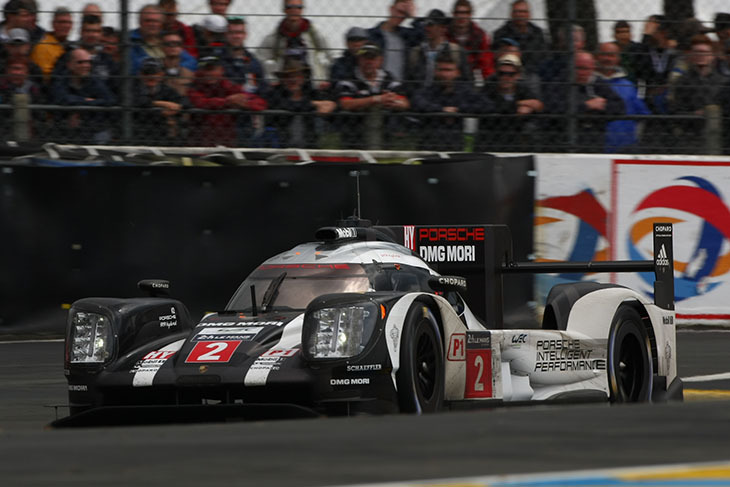 Behind though was the #2 Porsche of Neel Jani, with Loic Duval moving to third, getting by Timo Bernhard. Andre Lotterer opted to pit the #7 Audi for its first stop and change from intermediate tyres to slicks. Out front, with 10 laps completed, Conway’s lead was seven seconds over Jani, the cars hitting traffic for the first time. Duval pitted the #8 to also change to slicks, just one lap after Lotterer. The track almost bone dry by this point. It became a Toyota 1-2- on lap 11, with Buemi climbing to second. The #1 Porsche then dived in, Brendon Hartley climbing aboard for his first stint. When the first round of stops concluded, leading the race was the #7 Audi of Andre Lotterer, after slow stops for the Toyotas. The #1 Porsche as a result moved up to second, with the #8 Audi third. Lotterer’s lead was seven seconds over the chasing pack after 20 minutes of hour two, but the German pitted for an unscheduled stop and was pushed into the garage. The mechanics immediately began working at hyper speed to repair an issue on the hydraulics at the rear of the car, and changing the turbo. Meanwhile, the #1 Porsche of Brendon Hartley inherited the lead. Second Duval in the #8 Audi, third Conway in the #6 Toyota. As the race reached its 90 minute mark, the rain came again around the circuit and Hartley pounced on Duval to reach the lead at Mulsanne Corner. It was only a light rain though, not enough for teams to begin gambling on tyres. 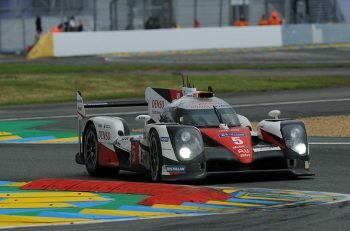 With the two leaders glued together, Mike Conway in the mixed conditions was catching them, making it a three-way battle for the lead between the three P1 factory teams. 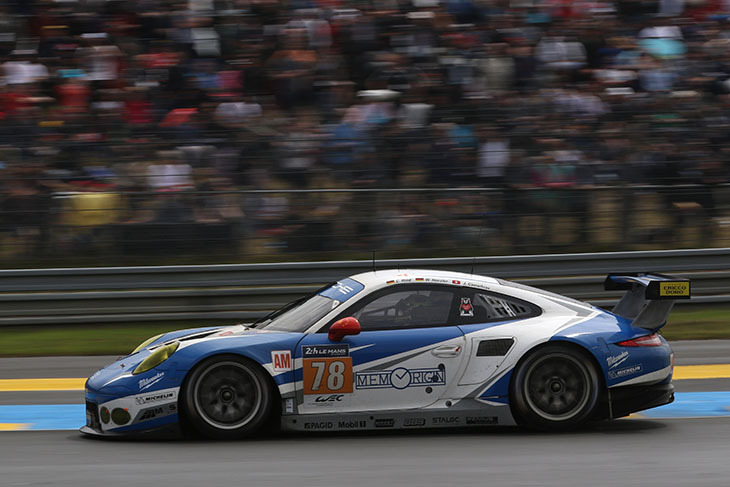 Back int he pits, the #7 rejoined the race, after losing 20 minutes, sitting in 59th place. Benoit Treluyer was aboard for his first stint. 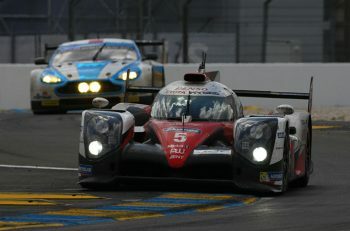 When Conway caught up, Hartley had pulled away by five seconds, and Duval had to focus his attention on the Toyota behind rather than the Porsche ahead. The pair ran nose-to-tail for most of lap 21, and then lap 22, but Duval pitted for the second time in the race before the Toyota was able to make anything stick. 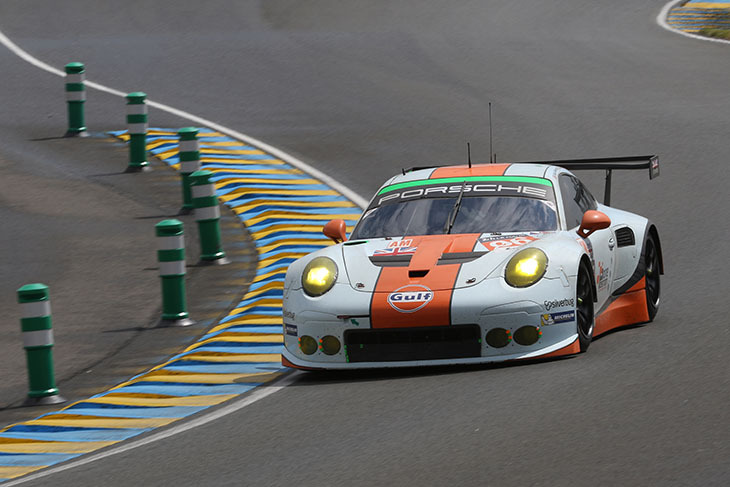 As the hour came to a close, the leading #1 Porsche also pitted, and the #6 Toyota would hold the top spot once more. 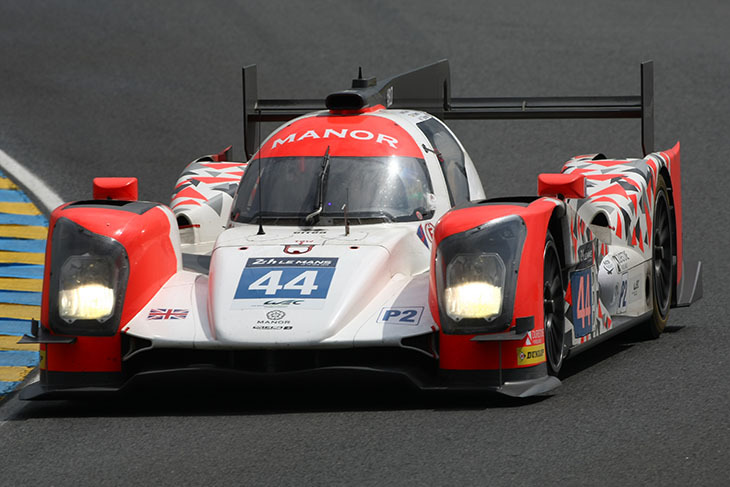 Manor take early control of the LMP2 race, leading the class by 20 seconds after 120 minutes of running. Thiriet second, Strakka third. At the start of the second hour Rast’s G-Drive Ligier pitted from the lead, handing over the front spot to Lapierre, from Panciatici second in the #35 and Chatin third for SMP Racing in the #37. Only five P2 cars remained on the lead lap. Into lap 11, and that number dropped to four, as Petrov brought the #37 down the pit entry for fuel and tyres. With the track effectively dry, the first switch to full slicks took place, initially with Audi’s P1 runners, but subsequently to almost everyone else opting for a pitstop. The early stop for Vanthoor now looked to have paid dividends, as the #49 Michael Shank Racing Ligier eased through into the head of the class at ten-past the hour as the rest of the leading P2 group peeled away into the pitlane for fuel and tyres. The strategy even saw him briefly moving ahead of the #13 Rebellion, although order was swiftly reaffirmed as Imperatori swept by moments later. With seventy minutes gone the penalty for installing a new engine in the #49 effectively negated all that excellent strategy, as a five-minute stop-go was imposed on the P2 leader. Cruel timing, but anticipated, perhaps. Vanthoor pitted at the end of the 12th lap, handing on the class lead to Roberto Merhi in the #44 Manor Motorsport Oreca, with Matthias Beche second for Thiriet by TDS (#46) and Jake Dennis third in the #38 G-Drive open-topped Oreca. The erstwhile leader René Rast resumed in seventh, illustrating the benefit to those who made the earlier tyre change. The question raised by all this was, who was still on intermediates, with slicks clearly the compound to have .. and was the forecast of more rain by the ACO going to have any impact, if it arrived. The issues for André Lotterer in the #7 Audi handed 7th overall to the P2 leader, Mehri having a 14 second lead over Beche (#46) after Panciatici pitted the #35 and Dennis moved the #38 up to third. Jonny Kane, pedalling the #42 Strakka Racing Gibson frantically in fourth was coming under intense pressure from Bradley in the KCMG #47, less than half a second between them as they started lap 16. At half-past four the Michael Shank Racing Ligier served its five-minute penalty, resuming in 56th overall, Vanthool still in the cockpit. Only a mistake by Dennis in the #38 could account for the very rapid way in which Jonny Kane then swept through into third, ninth overall, and establishing a more comfortable buffer over Dennis in the second Gibson. Merhi continued to pull away, easing out a lead of some 20 second over Beche, who wasn’t enjoying such isolated luxury. Indeed, Jonny Kane was like the proverbial cork out of a bottle, and no longer distracted by Dennis in his mirrors, was now challenging for second, and generating a healthy two-second gap of his own. Ninety minutes had passed since the somewhat uninspiring start to this edition of the Le Mans 14 Hours. 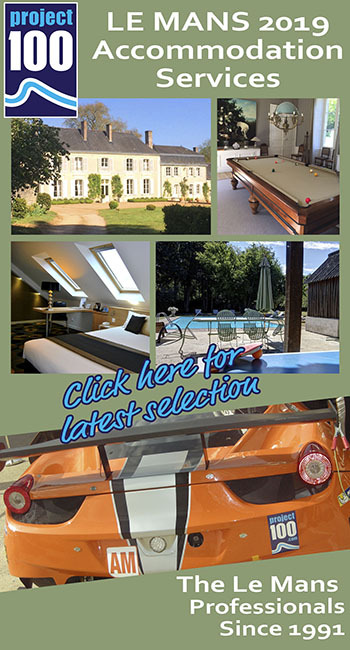 What’s more, further rain was being reported from zone 20, down at the toe-end of Mulsanne. Thankfully, it didn’t come to much. Twenty-to-five and the leading quartet in LMP2 dived into the pitlane; Merhi, Beche, Kane and Dennis all electing to make the stop, and allowing Rast back through into the lead, regaining the position he relinquished forty minutes earlier. Petrov inherited second for #37, and Albuquerque moved into third for the #43 RGR Sport by Morand Ligier. Next time around, Rast pitted for the second time, and we had yet another, different leader of this very confusing race; Petrov fronting P2 for SMP Racing. Next tour around and both he and second-placed Albuquerque followed on down the pitlane for what were scheduled pitstops for fuel and tyres, allowing Merhi back into the lead, that significant earlier advantage now paying dividends as the pitstops came into play. 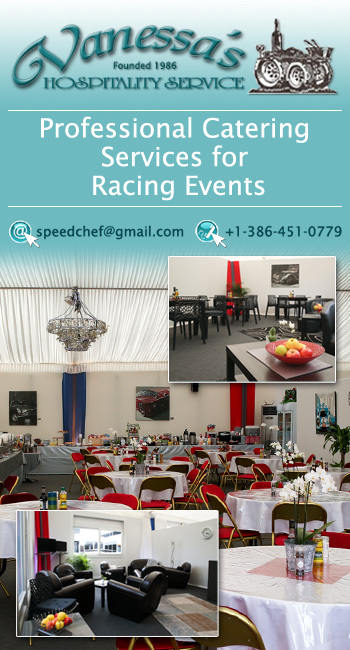 Chatin stood second for Panis-Barthez Racing in the #23 and Matthias Beche third for TDS. Kane, fourth for Strakka, was once again under pressure from Dennis, less than half a second separating the two Gibson chassis. Coming through to complete the end of the second hour, and with a good seventy minutes of racing proper under our belts, LMP2 had settled down, at least at the sharp end, with Mehri enjoying a 18 second lead for the #44 Manor Motorsport Ligier over Beche, second for Thiriet by TDS, and Jonny Kane, still fending off Dennis in the battle for third. At the other end of the class, Nakano was just emerging from the pits after a lengthy stop that had dropped the #34 Race Performance Oreca down to 57th overall, five laps down on the class leaders, with the #28 Pegasus Morgan just a lap ahead. 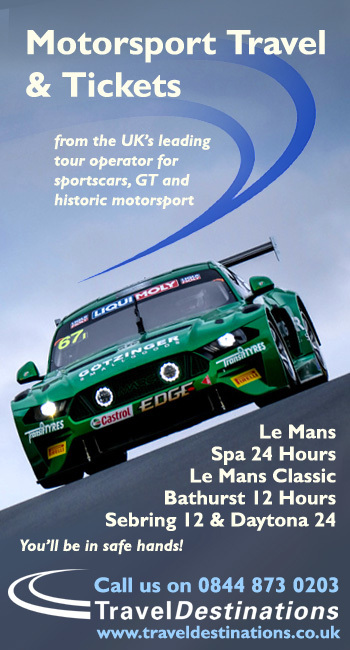 Ford took control at the end of the second hour as the GT’s prodigious dry pace allowed Richard Westbrook to catch and pass erstwhile Porsche leader Fred Makowiecki. In GTE Am, Weathertech Porsche man Leh Keen’s charge faded in the face of Porsche factory drivers Pat Long and Wolf Henzler in the #78 KCMG and #88 Abu Dhabi 911s. Earlier in the hour, Makowiecki was leading by 13.8 seconds from Westbrook’s Ford GT, while a battle was erupting in Pro for fourth as Pilet, Gavin and Fischella entered the Mulsanne straight on lap 13. Three-wide on the straight, Fisichella took the #64 Corvette and then set about the Porsche. The #60 Formula Racing Am Ferrari losing a wheel at the second Mulsanne chicane was little distraction to the three scrapping Pro cars. Fisichella out-dragged the Porsche on the run down to Indianapolis, making it stick and starting to think about the other AF Corse car ahead in the hands of James Calado, these the ex-F1 stars having a point to prove. The #71 Ferrari though was on its own mission and closing down Westbrook’s second place. In GTE-Am, Keen initially held station at the front on slicks in the #89 Porsche, the prospect of completing the 24 hours as half of a two-driver squad far from his thoughts no doubt. Long’s Porsche was six seconds back, but got on a charge to close the gap to 1.4s, ahead of Henzler’s KCMG 911 in third. Rob Bell’s Clearwater car had dropped back having run third. The #61 pitted for new rubber as the rain started again, while Adam Carroll’s Gulf Racing UK Porsche was a beneficiary of an early stop, the distinctively liveried 911 RSR sitting fourth. Long was pushing hard, bringing him right onto the back of the #89 Porsche for the Am lead. Henzler’s gap in third also improved, the more experienced ‘factory’ Porsche campaigners clearly knowing how to apply the pressure. Keen’s lead went on lap 18 and he lost second to Henzler on the next lap. Makowiecki was being warned for exceeding track limits in GTE Pro lead as Westbrook’s Ford GT started to improve its pace, eating into the Porsche at two seconds a lap at times. James Calado was only a second behind in the #51 Ferrari. Calado’s fellow Brit Bird then got a better exit out of Mulsanne than Pilet’s Porsche and moved the #71 488 ahead to take fifth by the time the pair reached Indianapolis. What of Ford’s progress? The #67 car was back in the pits, the back end immediately off the car and looking suspiciously like a return of its earlier gearbox issues. The #68 car ran eighth before overhauling Ollie Gavin’s #64 Corvette to take seventh. Pla’s #66 entry was ninth as a more cautious pace seemed evident. The GTE Pro regulars seemed to have rather established their pace at the front before Westbrook started a typical charge, applying enough pressure on the #92 Porsche to grab the lead for the Ganassi USA car just before the hour closed.